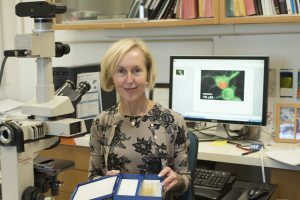 With $217,500 in grants from the FRAXA Research Foundation, Dr. Karen O’Malley and team studied the function of mGluR5 when it is inside cells. The conventional wisdom has been that mGluR5 is active only at the surface of neurons, but Dr. O’Malley has shown that mGluR5 also functions inside cells. In fact, 90% of mGluR5 is in the interior of cells. Many of the symptoms of Fragile X syndrome (FXS) are thought to arise due to overactive metabotropic glutamate receptor 5 (mGluR5) signaling, which is normally opposed by the protein missing in FXS, FMRP. mGluR5 is an important neuronal receptor that controls proteins involved in modifying synapses, which are the bridges by which neurons communicate with one another. Through its involvement in remodeling synapses, mGluR5 has been implicated as a key player in many neurological processes, such as learning and memory. Although receptors like mGluR5 are traditionally thought to initiate their signaling cascades from the cell surface, there is mounting evidence that intracellular receptors, located on membranes inside cells, are also physiologically active. However, studies of mGluR5 up to this point have focused solely on cell surface signaling, despite the fact that that up to 90% of mGluR5 is intracellularly located. To remedy this, our research concentrates on discovering the properties and functions of intracellular mGluR5 as compared to cell surface mGluR5. In additional, it is also essential to test the permeability of mGluR5 antagonists in order to determine whether they are acting at the cell surface mGluR5 alone or if they reach the inside of cells as well. By analyzing the roles of intracellular and cell surface mGluR5 in FXS and determining the permeability properties of mGluR5 antagonists, we hope to achieve increased specificity in targeting drugs to the appropriate cellular locations and thus improved treatment of FXS. Researchers led by Dr. Karen O’Malley at Washington University School of Medicine in St. Louis published results of their work on mGluR5 and Fragile X Syndrome. Pharmaceutical companies have developed therapeutic compounds to decrease signaling associated with the mGlu5 receptor, moderating its effects on brain cells’ volume controls. But the compounds were designed to target mGlu5 surface receptors. In light of the new findings, the scientists question if those drugs will reach the receptors inside cells. “Our results suggest that to have the greatest therapeutic benefit, we may need to make sure we’re blocking all of this type of receptor, both inside and on the surface of the cell,” said senior investigator Karen O’Malley, PhD.